Schuster Finds A Way to Delay the Reopening of Hinsdale Middle School until Tuesday, February 4. Dr. Schuster plans to prolong the split shift schedules at CHMS one more day, with the "Open House" at Hinsdale Middle School for the community not taking place until Monday night (2/3) and HMS not reopening for students until Tuesday, 2/4. Dr. Schuster emailed her daily update on the HMS mold remediation progress to the D181 community at 6:15 p.m. It is copied below. FOR THE FIRST TIME EVER, she states that before HMS can reopen, representatives from the architecture firm of Healy Bender and the Dupage Regional Office of Education will complete a walk through on Monday "as an extra measure to ensure the school is ready." Why would Healy Bender OR the ROE need to "complete a walk through?" Why are their eyes needed to "ensure the school is ready?" What has their involvement been in the mold remediation process that has kept HMS closed since January 17? The answer is NONE! At last Monday's Board meeting, Healy Bender got the Board to approve nearly $400,000 in soffit work and wall replacement work still needed to close open air gaps at HMS that are allowing cold air to enter the building. But those gaps will still exist when school reopens because the repair work is not scheduled to happen before then. But that's it for Healy Bender's involvement with this crisis! They are not a mold remediation or water extraction company. They are not the air quality and swab testing company. What can they possibly do on Monday to "ensure the school is ready" to be reoccupied by teachers and students? What about the ROE? Yes, it has been involved in helping Dr. Schuster's administrators understand the requirements of the school calendar and has facilitated getting the permissions needed from the Illinois Board of Education to allow split shifts at HMS. But that's it! They have NO AUTHORITY of any kind to dictate whether or not HMS is "ready" to be reopened. Did Dr. Schuster EVER allude to this type of "walk through" being needed or required in any one of the THREE board meetings held in the last two weeks to discuss the HMS crisis? Did she EVER say ANYTHING publicly or in any of her "daily updates" about adding an extra step to the long mold remediation process BEFORE the school could be reopened to students? NO SHE DID NOT! Why should the HMS students be forced to miss another 1/2 day of instructional time on Monday? If the building is ready for TEACHERS to be in the building on Monday morning, it should be ready for the students!! This leaves us scratching our heads and asking if Dr. Schuster is really so blatantly irresponsible to the educational needs of our students that she thinks she can test the patience of the D181 HMS parents with this ridiculous extension of split shifts at HMS? Or is something else behind the need to keep HMS closed until Tuesday? Let's not forget that tomorrow is Friday, followed by a weekend. Perhaps Dr. Schuster is once again planning to leave town for the weekend and would not be back in time for a Sunday night "Open House." Certainly the community would expect that she be physically on site for this event. We all deserve an explanation, because the "spin" and new "condition" that must be met before HMS reopens to students is ABSOLUTELY UNACCEPTABLE!! It is time for parents to rally. Call your D181 Board Members and DEMAND that HMS reopen on Monday, February 3. Write them signed letters demanding accountability! We cannot sit back now and allow our students to lose any more instructional time. This would not be in the best interests of anyone, except perhaps Dr. Schuster. Hypocrisy of Board President Turek Exposed! Yesterday, we received a comment that "shined a light" of transparency on the hypocrisy of Board President Marty Turek. That comment, as well as those submitted by angry community members, are published below. This morning, we were asked to convert the comment into a free standing post in order that it would not get lost in the coverage of the HMS mold crisis. We agree that the information should be front and center for everyone to read. As one comment stated: "Mr. Turek is a hypocrite." Well, well, well. Look who is calling the kettle black! It seems that since Spring 2013, Mr. Turek has not just filed one FOIA request, but multiple, broad requests dealing with the technology infrastructure in District 86, District 90 and District 13. (Who knows if he filed in more than 3 districts....) And he has done so on behalf of his technology business, Vision Solutions. Some of the comments rightly pose the question: WHY is he doing this? For personal reasons? For commercial purposes? What is his motive? Considering that he has been so critical of others who have filed FOIA requests in our school district, we demand an explanation and invite Mr. Turek to submit a comment of his own. And we caution Mr. Turek to carefully watch his words in the future, since the old adage is true that what goes around comes around. FOIA Requests made by Marty Turek. The Parents and readers of The Blog can google for authenticity. D. Freedom of Information Request. Request of April 19, 2013. Mr. Marty Turek, Vision Solutions, requested copies of 1) List of District Wide Computer Servers with the number of physical, virtual, web and database servers detailing processors, cores, memory hardware maintenance cost and design models; 2) List of all application vendors with version number; 3) Upgrade schedule for servers; 4) List of data storage environment: Terabirts of NAS, SAN, Incremental Backup and Long-Term Archival Storage with manufacture and model; 5) Upgrade or expansion plan for data storage; 6) current disaster recover vendor contract or plan; 7) Main IT vendor with last three year spending for 2012, 2011, and 2010; and 8) annual yearly IT budget. Documents responsive to item #7 and item #8 were provided. Requests for Items 1-5 are exempt pursuant to Section 7(1)(o) of the Act, which exempts “Administrative or technical information associated with automated data processing operations, including but not limited to software, operating protocols, computer-program abstracts, file layouts, source listings, object modules, load modules, user guides, documentation pertaining to all logical and physical design of computerized systems, employee manuals, and any other information that, if disclosed, would jeopardize the security of the system or its data or the security of material exempt under this Section. Dr. Bartelt reported that three FOIA requests had been received since the last meeting. Marty Turek requested information regarding the District’s technology equipment and maintenance, i.e., list of computer servers, upgrade schedule, and annual budget. Looks like we have Turek by the short hairs! Really, how can a BOE president makes such crude remarks during a public meeting (and children were present)? Moreover, why is he allowed to be a bully and file FOIAs be we cannot? Most importantly, what is his line of work and is he benefiting personally from his position as board president? Schuster Finds Time to Give TV Interview, But Did She Find Time to Accompany Her Staff to National Louis University? Below is Dr. Schuster's daily update. Her email, along with what she said during an interview she gave today to ABC Local News for their 6 p.m. broadcast, indicates that next Monday (February 3) is still the target date to reopen Hinsdale Middle School. Click to open 1/29/14 ABC Local News coverage. There is a question circulating in the community about whether while Dr. Schuster found time to participate in the on camera interview, did she not accompany central administrators, teachers and local fire and police officials to National Louis University in Lisle, where they continued planning for a possible relocation of HMS? Her email references a "team" of district staff who went to visit the alternate location, but is silent on whether she was part of the team. If it is true that she did not accompany her staff, the question becomes WHY NOT? As concerned parents, we expect Dr. Schuster to be actively involved in every aspect of planning such a move. In our opinion, unless she is physically present to tour the facilities at National Louis University, she will be unable to properly assess all the possible issues that might arise. Her absence from continuous onsite involvement throughout the HMS crisis was also evident during Monday's board meeting. She had almost nothing to say, deflecting almost all substantive questions about the remediation work to board members or other central administrators. Based upon what was said during the board meeting, we question whether she was even in town last weekend, while the around the clock mold remediation and asbestos testing continued at HMS. During the board meeting, President Turek and Member Clarin made a point of naming D181 staff and board members who had toured the school last weekend. Her name was notably absent from this list. We are quite certain that after all the criticism that has been directed at her, had she actually gone to HMS last weekend, it would have been pointed out during the meeting. It was not. Dr. Schuster is responsible for overseeing all aspects of D181's day to day operations. During a facilities crisis unlike any the district has experienced in years, the community has a right to expect the superintendent to personally oversee all the work done at HMS and at the relocation site. The superintendent is responsible for making the hard decisions. She is the leader. She cannot continue to delegate onsite responsibilities to her staff. Perhaps concerned community members will seize the opportunity at Friday's CHMS/HMS basketball game to ask her about all of this. Her email today made sure to inform everyone that she will be there. We guess she wants to leave everyone with the impression that by showing up for a sporting event at 4:45 p.m. on a Friday afternoon, she is "in town," actively involved, onsite and visible. We're just not buying it. Split shifts will continue, with no change in the start or end times, through this week. After reviewing the options presented for off-site locations, National Louis University, in Lisle, was selected as the most viable option. Board docs includes a memo describing each option. Click to open HMS Alternatives memo prepared by Dr. Schuster. The Administration has been tasked with obtaining all permissions needed to utilize this site which would cost approximately $5000 per day ($140/day per classroom for 35 classrooms). Should it appear that HMS will not reopen next Monday, the Board might convene another emergency meeting to determine when to end the split shifts and switch to the off site alternative. Parents spoke during public comments and indicated that their preference is to not displace HMS students a second time. Since D181 has been given permission to run split shifts through 2/28, the parents said that it would be easier to continue with that schedule. Board members and administrators raised concerns that the split shifts are not the best educational option, but said that no decision would be made until further information becomes available on a possible start date at the off site location and end date of the HMS mold remediation work. Costs to Address HMS Facilities Issues Rise Dramatically with No End in Sight. During the 1/27 Board Meeting, the progress of the HMS mold remediation and water incursion issues was discussed as well as additional costs. All baseboard in the building was removed to assess what was behind it. 7000 feet of drywall behind the baseboard was found to have mold growth on it. This led to more invasive probing by opening walls. Full eradication of 9000 linear feet of various types of mold growth took place and 2 miles of drywall was replaced. The building has gone through 3 separate cleanings. The duct cleaning will commence on 1/28 and is expected to be done by Saturday morning. Baseboard will not be reinstalled prior to the school reopening, nor will the the drywall be painted. This work will be done after school hours. Once the cleaning is completed by SERVPRO, Integrity Environmental Systems will conduct air quality tests and swab tests for mold. The representative stated that there are still "lot of discussions" that need to occur to determine exactly what and how much testing needs to be done in order to "clear" the building for re-occupancy. The Integrity representative stated that if every room is tested, it will be difficult to get the analysis and reports completed by next Monday. He stated that he expects all of the samples to be "favorable"and believes the school could be reoccupied even before the full report is completed. Integrity stated that it would be late Sunday, at the earliest, before the building could be cleared for re-occupancy. During the meeting, Board Member Clarin expressed his dismay that the information given during the meeting did not match what he had been told a couple of hours before the meeting, but he did not elaborate on exactly what the differences were. Concerns were expressed about the elevated levels of C02 that have been found in the building. He asked what the health impact of high levels could be and was told it can lead to fatigue and not feeling well. This raises a ventilation issue that must be addressed. Board Member Garg asked why the MRC carpeting was not being replaced. The answer was that because the carpeting is plastic based, mold cannot grow on it and it has been hot-water extracted and is clean. Ever heard the expression "circle the wagons?" That is exactly what the majority of the D181 Board of Education is doing right now. They are circling the wagons around Dr. Schuster to protect, rather than hold her accountable for her lack of transparency, and in our opinion, her mismanagement of the HMS crisis. How is the Board doing this? Last night's board meeting was a perfect example. Only Board Members Heneghan and Garg questioned when the "asbestos" issue was first discovered during the HMS mold remediation process and exposed that basic safety checks have not been done as required at all the D181 schools that contain asbestos. Only Mr. Heneghan expressed outrage that the Board had not been made aware of the HMS asbestos issues until after 5 p.m. yesterday. No other board member took issue with the fact that Dr. Schuster sat on this information for nearly one week. Mr. Nelson's "out of town voice" berated Mr. Heneghan, rather than push for an explanation. Mr. Turek told Mr. Heneghan his words were inappropriate, rather than push for an explanation. The rest sat silently or minimized the situation by having the remediation companies emphasize that the situation was completely contained and there were no ongoing safety concerns related to the asbestos. The majority of the board effectively shut down Mr. Heneghan's attempts to discuss Dr. Schuster's failure to communicate the asbestos situation to the Board. So what did we learn from the remediation companies' representatives and Mr. Heneghan pointed out last night? Board Member Nelson Must Resign and Allow a Committed Community Member to Fill His Seat! Today we will be publishing 4 posts. This first one highlights the Board Member Attendance Page that can be accessed by clicking on the side link. The Board is made up of seven members, who were elected by us to represent our interests and ensure the highest quality of education for our children, as well as representing all D181 taxpayer's interests. Our expectation is that election to this important position requires more than just being an audible voice during meetings. It requires a physical presence that shows a full commitment to the responsibilities of the job. Therefore, we have copied the updated attendance page below, because we think it is important for the entire community to see who has clearly not made the commitment to serve the electorate. As you can see from the chart below, Board Member Nelson has been "physically" absent from 19 of the last 29 meetings (for which attendance is known). He has called in to 9 of those meetings, but completely missed 10 of them. been physically in attendance at only 34.5%. Even when he has "called in," his contributions to the discussions have been minimal, at best, with most of his commentary being celebrations of what the administration is doing (when what is called for in a growing number of instances is sharp rebuke) or criticism for concerns raised by fellow board members and community members. He has supported Mr. Turek's suggestion that the Freedom of Information Act needs to be reformed to deal with the "bullies" in D181 who are seeking release of public information. Is this behavior really what we voted for? It is time for Mr. Nelson to resign. We have said it before, and we will say it again. Unfortunately, there is nothing the electorate can do -- statutorily or through board policy -- to oust him. In fact, there is little his fellow board members can do, except encourage him to step down so that a fully committed community member can fill his seat. The only person who can do what is right and do it now is Mr. Nelson. Will he realize that he is doing more of a disservice to the electorate by continuing to pretend to fill his board seat, rather than by stepping down? Please Mr. Nelson, tender your resignation. Shortly before 5 p.m. Dr. Schuster sent her "daily update" out to the D181 community. It disclosed for the first time that on January 21, asbestos was discovered in tiles at Hinsdale Middle School that were broken during the mold remediation process. Let us first state that it appears that the asbestos HAS BEEN COMPLETELY CONTAINED and CLEANED UP. If we are to believe Dr. Schuster's email -- and for the sake of our students and HMS staff we hope we can -- there is no reason to be concerned that students or staff have been or will be exposed to asbestos. In addition, Dr. Schuster disclosed that as a result of the broken tiles and resulting cleanup and testing, the District discovered that it did not comply with an Asbestos Management Plan, that required a "basic checklist" to be completed every six months, with a report being filed with the Illinois Department of Public Health. The checklist that should have been completed in May 2013 was skipped and has now been scheduled for January 28. Dr. Schuster did not mention the discovery of possible asbestos during the January 21, 2013 emergency board meeting. Why didn't she? The board should demand an explanation at tonight's meeting. Dr. Schuster has known about this information for seven days. Not until two hours before tonight's board meeting did she disclose this to the public. At the January 20, 2013 emergency board meeting, Member Clarin directed Dr. Schuster to provide the community with daily updates. We would assume that Mr. Clarin would expect Dr. Schuster to actually be complete and transparent in these updates and not pick and choose what to tell the community. Why was the May 2013 "basic checklist" required by the Asbestos Management Plan skipped? Why wasn't this discovered until 8 months later and only in the midst of the mold crisis at HMS? We are most concerned about #4 above because it is yet another example of how the administration is not minding the ship. This is not a Board issue, it is a Dr. Schuster issue. Many times in the past four years, she has reminded the board that it is not their job to micro-manage and that it is her job to oversee the day to day workings of the district. It is her job to hire and hold her staff accountable. It is the board's job to hire her and hold her accountable. So whose fault is it that a basic, day to day, environmental safey check that was intended to ensure the health and safety of students and staff in a D181 building was not just skipped but completely overlooked until now? We believe it is Dr. Schuster's fault for not properly overseeing the department responsible for maintaining buildings and grounds. Not too long ago, Sue Kamuda, the Director of Buildings and Grounds retired. When she did, rather than name another director, that department was rolled into the Business Department at Dr. Schuster's recommendation. Obviously that was a mistake. Having made that mistake, her next mistake was not properly reviewing the work being done by the staff in that department and making sure that they were doing their job -- every aspect of it. Now, the Board must hold Dr. Schuster accountable. How many environmental facilities and health concerns, and now safety checks, must be ignored before the Board realizes that the captain of the ship is causing it to capsize? It's time for real accountability by the majority of the Board. We hope the Board does not allow Dr. Schuster to make excuses, or blame her staff for what she is ultimately responsible for. That would be a "short-sighted" solution that will not fix the bigger, long term problem facing D181. Why were teachers told last Thursday 1/23 that HMS would not reopen until Monday Feb 3 and parents not told simultaneously? Shouldn’t Schuster communicate the same information to parents as she does teachers? How much more mold was actually discovered and where? Why is there no mention of the additional costs that the district will incur as a result of this additional mold remediation work? No advance statements of additional costs have been mentioned. Will this be given as a surprise tactic at tonight’s meeting? We continue to see a lack of updates by Schuster and her administrators who have been sitting silently for weeks while children and teachers struggle with automatic math acceleration. Why are there no updates? How are middle school students who have “opted in” performing in math this year? How are the new programs of Reading Fundamentals, Writer’s Workshop and Words Their Way working for students and teachers? Where are the presentations Kevin Russell and Dawn Benaitis should be making regarding student performance? What is the status of our Special Education students who, according to MAP and ISAT test results, are not performing in acceptable ranges? Why isn’t Kurt Schneider presenting updates? Our administrators are being paid way too much to sit idly in front of computer screens, surfing the Internet or reading during board meetings. We have not seen updates in months all the while there are serious issues, as we have documented previously, concerning curriculum and student performance. Mark our words: Schuster will try to use her spin and downplay the time lines and amount of mold discovered at HMS while expecting very little from her administrators. Heck, we wouldn't be surprised if shel tries to “celebrate” herself and the assistant superintendents, even though it was mainly due to the hard work exhibited by Principal Pena, Martha Hendrickson, Rocky May, Gary Frisch, Doug Eccarius and Board Member Clarin that allowed students to begin their split schedule at CHMS. Were it not for these individuals, there is no telling what HMS students and families would be contending with at this point. Bottom line: like our home faucets continue a slow drip to offset freezing in this extreme weather, so too does the information Schuster chooses to communicate continue to be watered down, scrubbed, and cleansed. Drip, drip, drip…the lack of accountability continues…. 1/25/14 Daily Update from Dr. Schuster on HMS Mold Remediation Progress Leaves Us Asking: Why Isn't the MRC Carpeting being Replaced? Last night Dr. Schuster emailed a progress report (copied below) to the D181 Community reporting that work continues at Hinsdale Middle School to remediate the mold and that it is still on track for the February 3 re-opening date. We thank the administration for moving the timeline information up to the beginning of the email. After reading this email and the one she sent out on Friday, we are left baffled by one item. Why isn't the MRC carpeting being replaced? Why is it only being cleaned "again"? HMS teachers already stated during public comments that they were told it only needed to be dried out because it was only soaked with clean water. They questioned this conclusion because to get to the carpeting, the water had to soak through the roof, ceilings and drywall, much of which we now believe contained old mold, not to mention dust and dirt that has accumulated over the years. We already know that initially the remediation company tried to dry out the carpeting. Now it appears that the carpeting will be cleaned "again." So how many times has it been cleaned? The real question is: How much money would it really cost to replace the MRC carpeting? The MRC is not that large! Taxpayers already have to foot part of the nearly $400,000 bills submitted by SERVPRO and Integrity Environmental Services. It seems to us that new, never before contaminated carpeting for the teachers and students to walk on, won't break the bank. Why would Dr. Schuster or the Board skimp on this? We hope the Board asks Dr. Schuster what new carpeting would cost, at the Monday 1/27 board meeting, and then directs her to have it installed. Another question they should ask is whether the cost of the remediation by SERVPRO is going to increase beyond the $129,000 since the work is going to take them almost twice as long as they projected at the 1/20 emergency meeting. Hinsdale Middle School No Longer Projected to Re-Open Before Monday, February 3. This afternoon Dr. Schuster sent an email to parents. Text copied below. Classes at HMS will not resume until Monday, February 3. SERVPRO will not be finished with the baseboard/drywall removal and duct cleaning by Sunday as previously projected. The new date is Friday, January 31. Integrity Environmental Services will not conduct testing on Sunday as previously projected, but will do so after SERVPRO finishes on January 31. Test results should be ready by Sunday when an Open House will be held for parents and staff. According to Dr. Schuster, this timeline is now "fluid" and further delays "are possible." Recognizing that split schedules cannot go on indefinitely, the administration is investigating other sites to move HMS students to if further delays occur. At the January 27 Board Meeting, it will present the Board with "initial consideration" for off site locations. In light of the return of sub-zero weather, all schools might be cancelled next Monday. (The high school parents received an email today with this advisory, but it said school might be cancelled Monday and Tuesday). Guess we all better hope the cold winds shift! We are frustrated. No mention of possible delays was made in Dr. Schuster's email to parents last night. Why did it take all week for parents to learn of a five day delay for completion of the work by SERVPRO? On Monday, Board Member Clarin asked Dr. Schuster to provide the D181 community with daily updates. On Tuesday, Dr. Schuster told the Board that SERVPRO was a full day ahead of schedule. Then no further "timeline" updates were received until 3:20 p.m. today, after the elementary schools had recessed for the day. If parents are to trust the information coming from the Administration, it should not just be timely, but it must be complete. Our understanding is that teachers knew about the delay yesterday. Did the Board? If so, we are asking the Board Members to please advise Dr. Schuster that she should give us not just good news, but the bad news, as it comes in. We are all grown ups. We can take it. UPDATE TO ORIGINAL POST FROM THIS MORNING. This morning we were alerted that SERVPRO was on strike. 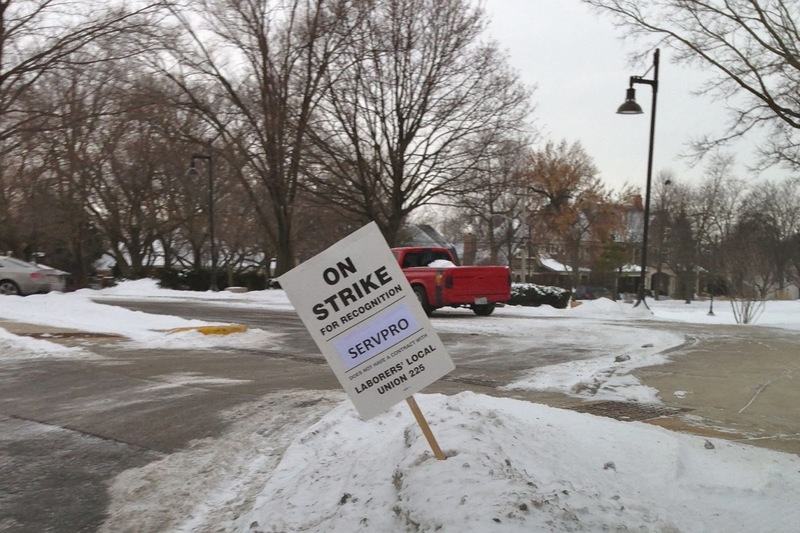 SERVPRO picketing signs were up at HMS. No notice had gone out to D181 parents from the D181 Administration, who we assumed already knew about the signs. We asked what this would mean for the date that HMS will reopen and urged the Administration to send the community, parents, teachers and staff an email update. Our second day of split sessions is underway. Student attendance remains high, with 95.2% of the CHMS students present this morning. We are working to resolve traffic and bus issues and are grateful to the Clarendon Hills Police Department for their continued assistance in guiding cars at drop-off and pick-up. 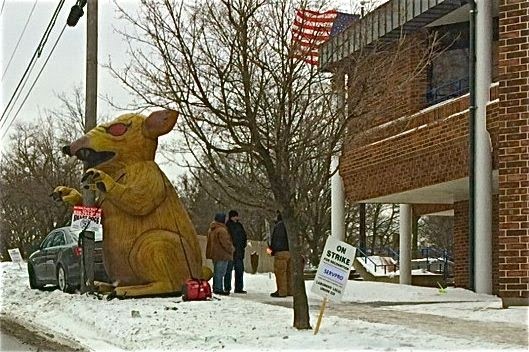 You may have noticed that a small picket line was present at HMS this morning. A labor group is picketing SERVPRO “for recognition.” The work at HMS has not been interrupted. This should in no way affect SERVPRO’s continued progress in eradicating the mold and preparing HMS for the return of our students and staff as soon as possible. Please watch for a message later today with a more comprehensive update on their progress. Who is SERVPRO using to do the work? More importantly, when is the work going to be completed. We hope Dr. Schuster does send out a "comprehensive" update today regarding the progress of the mold remediation, and informs the students, teachers, staff and parents whether the cleanup and testing will be completed on time. On time would be the date that was represented at the emergency meetings earlier this week. First, on Monday night the Board was told that the removal of baseboards and drywall, as well as the duct cleaning, would be completed by SERVPRO sometime this weekend, allowing for Integrity Environmental Services to enter the building and conduct more air quality and sample/bulk swab tests for mold. The results and report would take up to 48 hours, after which if the building was cleared for re-occupancy, parents and staff would be allowed to tour the building before it reopened next Wednesday. This assumed, of course, that nothing would go wrong. Then on Tuesday, the Board was told that SERVPRO was ahead of schedule by one day. No updates specifying a completion date have been issued by the administration since then. It is our understanding that perhaps the teachers received notification yesterday that the building will remain closed until at least next Friday, due to the discovery of more mold and the required clean up. We hope Dr. Schuster will tell parents today if there is any truth to this unconfirmed report. If there is truth to it, then we hope she tells us why she would send an email out to parents last night that did not provide this same information. After all, we expect her daily updates to provide everyone with the same and most current information. If this information is not correct, then we hope for the sake of all middle school students in D181 that BOTH CHMS and HMS can return to full day schedules no later than next Wednesday, January 29. The Board of Education voted 6 to 1 to approve "Option 1" and implement a split schedule that will allow HMS students to return to learning on Thursday, January 23. Tomorrow the teachers will report and participate in a planning day. On Thursday CHMS students will attend school from 7 a.m. until 11:30 a.m. and HMS students will attend school from 12 p.m. until 4:30 p.m. Logistical details will be emailed to parents tomorrow. At a future meeting, the BOE will decide whether to waive the two days all D181 students missed due to the polar vortex and waive another two days that HMS students missed. According to Kevin Russell, the Assistant Superintendent of Learning, the current calendar had more instructional days built in than are required, so the weather absences can be waived (if the Board so chooses) and the school code also allows up to 2 days of required instruction to be waived if a school is closed due to an emergency. With HMS students returning to school on Thursday, they will have missed a total of 5 days. If four of the days are waived, they will only have to make up one day. It will be up to the Board to decide if the missed instructional days should be made up. Had the BOE approved Option 2, which was Dr. Schuster's recommendation, HMS students would have missed a minimum of 7 days. During the discussion, Board Member Vorobiev asked Dr. Schuster to clarify exactly what Option 2 meant. Under Option 2 a split schedule would begin next Monday only if it was determined that HMS could not reopen next Wednesday. If HMS could reopen next Wednesday, then students would not attend school at all until then. Board Member Heneghan pointed out that in light of this new explanation by Dr. Schuster, Option 2 was really the same as Option 3. The only difference would be if the remediation work went beyond next Wednesday, in which case a split schedule would be implemented. In light of the knowledge that HMS students might not return to school at all before next Wednesday, the Board voted to implement Option 1. Board Member Nelson (who called in by phone -- again) initially expressed disapproval of a split schedule, but ultimately voted yes. President Turek (who called in by phone) voted no. Both expressed concern that half days would not provide a high quality educational experience and it would be better to add full days to make up for the missed days. Agenda for Tonight's meeting:Click to open agenda. Board Report outlining three options and making one recommendation: Click to open report. Proposed Split Schedule at CHMS for both schools' students: Click to open schedule. Proposed HMS Room Assignments at CHMS: Click to open room assignments. "Option #2 - HMS would be closed for the remainder of this week. If the ductwork cleaning has not been completed by Sunday, January 26, implement a split schedule with Clarendon Hills Middle School beginning Monday, January 27 (with CHMS attending from 7:00 – 11:30 a.m. and HMS attending from 12:00 – 4:30 p.m), until Hinsdale Middle School is reopened." Option 1 would also implement a split schedule but it would begin in two days on Thursday, January 23. Whatever option is approved by the BOE, the "missed days" so far must be made up. Under Option 2, the district would use currently scheduled "Not in Attendance Days" on 2/17 (President's Day weekend), 4/18 (Good Friday), June 2 (Grading Day) and then use Emergency Days the week after school ends for all other students. The number of emergency days would depend on the number of days the students have been off from HMS. The dates of the Emergency Days are June 6, 9, 10, 11 and 12. The Administration is also recommending that the two days ALL students missed on January 6 and 7 not be made up. That would mean that if students stay out of school all of this week, they will have 5 instructional days to make up. Tonight's meeting should be quite interesting. We are impressed that the Administration was able to put together this presentation in less than 24 hours after being asked to by the BOE at last night's meeting. The first question the Board should ask Dr. Schuster is why it took her this long to formulate this plan so students could return to school sooner. In our opinion, Dr. Schuster has already informed all parents that HMS will not reopen before Wednesday, January 29, so clearly, she believes that students will be going to CHMS for at least 2 days next week. If that is going to happen anyway, then why keep them out of school this week? Without hearing the full discussion, at this time, we would encourage the Board to approve Option 1 so that HMS students can return to school the day after tomorrow. Depending on what they actually discuss -- and we hope they have a meaningful discussion -- we may change our minds. We will weigh in after the Board votes tonight and let everyone know the decision. For the second night in a row, the BOE will convene an emergency meeting at 7:30 p.m. at Elm School to discuss the continued closure of Hinsdale Middle School due to the mold remediation. According to an email Dr. Schuster sent out at 2:31 p.m., the Board will be "deciding the instructional plan for Hinsdale Middle School students." "The Board will be presented with several options to consider, pending certification from the Regional Office of Education and approval by the State Superintendent." Dr. Schuster refers the community to Board Docs for more information about these options, but as of publication of this post, no information is available on Board Docs other than the skeleton agenda. Hopefully it will be updated before tonight's meeting. Last night the Board asked Dr. Schuster to explore "split schedules" for HMS student at CHMS. It is important that both HMS and CHMS parents attend tonight's meeting to listen to the options, including the possibility of a split schedule. We hope the Board will afford all parents the opportunity to ask questions before it votes on any option, as it did last night. Not only are our children's schedules at issue, but so are those of working parents, and teachers and staff who have young children at home. We want our children to return to learning as soon as possible, but want to be sure that all our questions and possible concerns regarding the option the Board selects are answered first. We hope we will also get an update on the mold remediation taking place at HMS and learn if any more mold was discovered today as the baseboards were removed. We will continue to monitor and report on any new developments. Thanks to our readers for alerting us to this new email. The District 181 Board of Education is holding an emergency meeting on Tuesday, January 21 (7:30 p.m.) at Elm School for the purpose of deciding the instructional plan for Hinsdale Middle School students due to the building’s closure. The Board will be presented with several options to consider, pending certification from the Regional Office of Education and approval by the State Superintendent. More information about these options will be posted on BoardDocs prior to the start of the meeting. The agenda will include an opportunity for public comment. The meeting audio and agenda will be available through the District website at www.d181.org > Board of Education. In considering the calendar for the school year, the Board of Education will have several options. District leaders will present those options to the Board at a future meeting. HMS families and staff should be aware that previously scheduled non-attendance days may be recommended as attendance days for HMS to offset missed school days. Please click here to view the HMS Facility Updates webpage:www.d181.org > Schools > HMS > Facility Updates. LATE BREAKING NEWS: HMS To Remain Closed Through At Least Tuesday, 1/28. The D181 Board of Education held an emergency meeting on 1/20/14 at 7 pm. The meeting lasted over 3 hours. The purpose was to address and approve nearly $400,000 in mold remediation work that must be completed before Hinsdale Middle School can reopen. Four news stations -- CBS, NBC, ABC and WGN -- covered the meeting. While we encourage everyone to listen to the D181 Podcast of the meeting, below are links to the available online news coverage, as well as our summary of what was discussed, disclosed and decided. After the meeting, Dr. Schuster sent an email to parents (it is copied at the end of this post). She confirmed what was disclosed during the meeting -- HMS will be closed through at least next Tuesday. As of Monday night, no alternate plans had been developed by Dr. Schuster and her administration to relocate HMS students to another building, however, Dr. Schuster must now formulate a plan to possibly implement split shifts at Clarendon Hills Middle School, and present it to the Board. This could possibly result in HMS students resuming classes -- at CHMS -- later this week. Click to open CBS coverage. Click to open ABC coverage. Click to open WGN coverage. MORE BREAKING NEWS: Emergency Board Meeting Scheduled for Monday Night For Board to Approve Work at HMS that Will Keep School Closed Through Friday, 1/24/14. The Board will be asked to discuss and approve additional expenditures related to the mold remediation issue at HMS that have been recommended by the remediation and testing companies and that need to be done before school can reopen. These steps include cleaning the duct-work throughout the building and removing the baseboard and any drywall that touches the floor. This work, if approved will have an "anticipated completion" that requires school to be cancelled through Friday, 1/24. The two remediation and testing companies -- SERVPRO and Integrity Environmental Services -- will present reports. The Agenda will include an opportunity for parent comment. The Administration will "confirm" with the Regional Board of Education options for making up school "as soon as possible." Gee, thanks for this new bad news, Dr. Schuster. BLACK MOLD, and Two Other Types, Confirmed in HIGH CONCENTRATIONS on Bulk Surfaces Tested at Hinsdale Middle School! The decision has been made to keep Hinsdale Middle School closed for at least 2 additional instructional days, and perhaps even more. Now parents need to understand exactly why that is necessary, what was actually found within the walls at Hinsdale Middle School and what this means for the health and safety of the students, teachers and staff. "On January 16, surface samples were taken of possible mold growth observed by SERVPRO staff, who were on site to perform deep cleaning and removal of drywall. The results from these samples showed low concentration of mold spores on the drywall and surface samples tested." Dr. Schuster omitted mention of all the facts. Nowhere in her email or on the new web page does she disclose that the test results also showed high concentrations of 3 different mold types on drywall "bulk" samples taken. Most importantly, Dr. Schuster does not tell parents, that "bulk" samples taken showed high concentrations of BLACK MOLD on two of the HMS drywalls that were tested. But don't believe us. Read the report yourselves. The following is the link to the Report on the Mold Test Results: http://www.d181.org/data/files/gallery/ContentGallery/91502_HMS_11614_Surface_and_Bulk_Sample_Report11.pdf. Read the Report and the Bulk Sample Data provided in Exhibit B. The two are not consistent with what Dr. Schuster represents. BREAKING NEWS! Mold Confirmed at Hinsdale Middle School. School will Remain Closed on Tuesday and Wednesday. Moments ago, D181 parents were finally told the truth. Mold has been confirmed at Hinsdale Middle School. The school will NOT REOPEN and will be closed on Tuesday and Wednesday. Below, we have copied the email parents received at 10:38 p.m. on Saturday night from Dr. Schuster. Why did it take her until almost midnight to send this to us? She continues to insist that the mold test results were not received by D181 until sometime today (Saturday, 1/18) but a review of the report now posted on a D181 webpage that has been created shows that the report is dated Friday, 1/17. (Click to open the report on the Mold Test Results.) On what date and at what time did the D181 administration receive the report? If they received it either "late" on 1/17 -- when Dr. Schuster earlier told the parents it would arrive, or early Saturday, if in fact the test company did not deliver it on 1/17, why did Dr. Schuster sit on the report and not immediately provide it to parents? Note that in her email to parents, Dr. Schuster claims that there will be a parent meeting the night before school reopens. She then says this will take place on Wednesday or Thursday, which obviously means that school might not reopen on Thursday either. While Dr. Schuster says the testing company will be available to answer questions about their report, she does not say whether or not SHE or the BOARD OF EDUCATION will answer questions. Will the meeting even be scheduled as a Board meeting? Will the Board members even be in attendance? According to Dr. Schuster's email, the results from the mold test showed "low concentration of mold spores on the drywall and surface samples tested." However, obviously the results were serious enough to keep HMS closed through at least Wednesday, perhaps Thursday. New mold test results are pending and there is also reference in the mold report to the possibility that the HVAC system in the building has been compromised and spores may be circulating throughout the school via this system. If the new tests come back as positive for more mold, what will this mean? Will the school remain shuttered indefinitely? HMS students will have missed a minimum of 5 instructional days (6 if school remains closed on Thursday). There is no doubt that this means that for them, the school year will not end on June 5, 2014. As mentioned above, two full weeks after the first pipe burst on January 4, D181 has created a webpage that gives a detailed timeline of the mold found at HMS. Test result reports are also linked to this page. We have copied the "history timeline" in its entirety below, but for those of you who want to see it on the D181 website and access all of the reports, you can click on the following link: http://www.d181.org/hms/facility-updates/index.aspx. Why has it taken this long to provide the community with all of this information? WHEN WILL DR.SCHUSTER WAKE UP and start acting like a responsible superintendent? WHEN WILL THE BOARD DEMAND THIS? The end of her employment in D181 cannot come soon enough! Why have the Hinsdale Middle School Mold Test Results Been Delayed? Can parents believe anything Dr. Schuster says? Yesterday, in the email Dr. Schuster sent to D181 parents, she said that HMS would be shuttered on Friday due to the discovery of possible mold and then said test results would be back late Friday. Interestingly, her email did not say when or even if she would provide parents with the results as soon as they were in. However, considering the serious nature of this situation, and the fact that HMS students were forced to miss a third day of school in two weeks, with very short notice for households with 2 working parents to arrange child care arrangements, we naturally assumed that the test results would be shared with D181 parents immediately. Well, it is now Saturday morning, and no test results have been released to parents. All parents received on Friday was a 9:15 p.m. email from Principal Pena -- not Dr. Schuster (although her name is added to the end of his email) -- saying that the results were not back yet. We find that difficult to believe. Hinsdale Middle School at “Crossroads.” We Demand Answers and Information Before the Doors Reopen! Earlier today, as we prepared to publish this post, news broke of Hinsdale Middle School’s closure tomorrow due to the possible discovery of mold. For the last 8 hours, since Dr. Schuster sent out the email announcing the closure, we have scoured our sources for any additional information, read online news coverage and watched the CBS news broadcast from HMS discussing the situation. And now we are angry! Why? Because it appears that after briefly emerging from what some of us might call a rat hole in order to sprinkle some small tidbits of information around in the midst of the serious announcement that HMS is closed tomorrow, the administration has reverted back to radio silence. No new or official information has been released by Dr. Schuster. No emergency school board meeting has been scheduled to publicly discuss what has happened. Every single HMS air quality test report for the last five years should be published on the D181 website – in its entirety. The community has a right to see the actual test data and see the conclusions drawn from this data. When the HMS mold test data and report is received by D181 on Friday afternoon, Dr. Schuster should immediately email a copy of the data and report to every single D181 parent, teacher and staff. It should also be published on the D181 website for the entire community to access. Any other reports that address HMS mold test data for the last five years should also be published on the D181 website. Most importantly, before HMS reopens on Tuesday (and for the sake of our children's education, we hope it does), the Board of Education should convene an emergency public meeting on Monday, January 20 and provide D181 teachers, staff and parents a forum to ask questions and receive answers from the Administration and Board regarding any of the HMS air quality or mold test results. Concerned parents have lost confidence in Dr. Schuster because of the way she has handled the environmental and health concerns at HMS. She has not been forthcoming with full and complete information. She has not provided any public forum at which parents or teachers were told about the HMS situation and were allowed to ask questions and receive answers. She did not even bother to stay in town to deal with last week's second burst pipe and continuing roof leak issues. So let's look at what Dr. Schuster and the Board did before this afternoon's decision to close HMS. Let’s review what they actually discussed during the 1/13 Board meeting. BREAKING NEWS! BLACK MOLD MAY HAVE BEEN FOUND AT HINSDALE MIDDLE SCHOOL. HMS CLOSED! Hinsdale Middle School classes have been cancelled and the school closed tomorrow due to the possible finding of black mold in the walls today. Earlier today, after school activities were cancelled and students heard that the walls were going to be torn up and dry wall ripped down because mold may have been found. Only after school ended, did Dr. Schuster send a cryptic email out to parents informing them that the Air Quality test report had come back NEGATIVE with the air at the school testing within normal limits. However, HMS would be closed on Friday because mold had possibly been found today and has been sent out for testing. As concerned parents, we don't trust what Dr. Schuster has said about the air quality report and we demand that it be immediately published its entirety on the D181 website. Sources since Dr. Schuster's email release are stating that BLACK mold was possibly found in the walls of the art room and in the stairwell walls closest to the teacher work room in the MRC. On Monday night, teacher Christine Maxwell reported that last Wednesday, a high level administrator who had only been in the building for a very short time declared that there was no mold, because he/she could not smell it with his/her sensitive nose. Guess their nose wasn't that sensitive after all. As we drove by HMS a short while ago, we saw that a CBS news truck had arrived. Stay tuned for further updates, including publication of the post we originally intended to publish today. D181 Teachers, Union Co-President and Former BOE President/Hinsdale Village Trustee Express Outrage and Disclose the Shocking Environmental and Health Conditions at HMS that the Administration has Ignored! We begin our review of the January 13 Board Meeting with two blog posts. The first details the environmental and health concerns at Hinsdale Middle School that were finally disclosed to the community during Monday's board meeting. The next post will address the Board and Administration's response to these public disclosures. We join in the outrage expressed during public comment by the HCHTA Union Co-President and 6th Grade HMS Teacher Heather Scott, HMS Reading Specialist Christine Maxwell and Former D181 BOE and Hinsdale Trustee President Michael Woerner. These respected community members described in graphic detail the overall health effects on the students and staff at Hinsdale Middle School as a result of the physical condition of the building, as well as warning of potential future litigation. Because of the serious nature of this issue, we are going to detail what these three individuals finally disclosed to the community, conditions that Dr. Schuster has, in our opinion, hidden from concerned parents and perhaps also from the Board of Education. · Following the survey a company called Environmental Integrity Services was contracted to conduct air quality and moisture testing. The results have not yet been released. · Right before school began last Fall, 4 classrooms had to be repaired for water and moisture damage and teachers couldn’t set up or access their classes until the night before school began. · Four additional classes needed to be repaired over the Columbus weekend due to the presence of water and moisture damage. · This concerned the teachers greatly as the presence of moisture can lead to mold which the teachers believe was present and removed. · Most recently, the burst pipes last week caused massive damage in the building and more water damage occurred last weekend. · Three classes have been shut down and students and teachers have been displaced into a severely space challenged building. · Bookshelves and lockers are on blocks, water buckets are in many rooms. · Rags are being used to mop up water creeping into rooms under baseboards. · Floor tiles are buckling. · Ceiling tiles are missing due to being waterlogged. · Blowers and dehumidifiers are in halls and many classrooms. 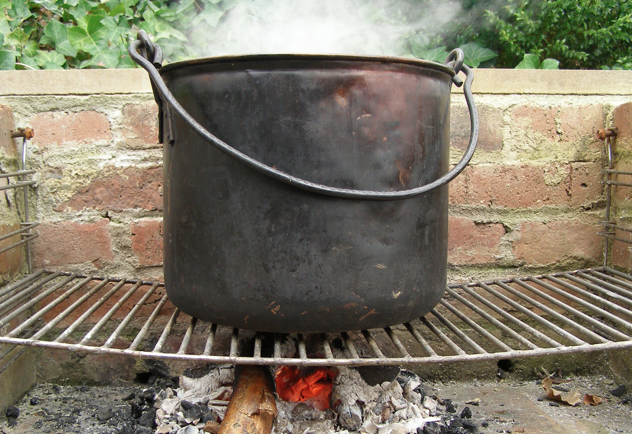 · PERHAPS THE MOST SHOCKING REVELATION WAS THE FACT THAT in more than one classroom, water dripped onto exposed electrical wires causing them to short and smoke WHILE CHILDREN WERE PRESENT. We will pause briefly in our recitation of the “disclosures” made by the teachers to state that in our opinion, the mere fact that Dr. Schuster allowed our students to be put at risk of possible electrocution should be grounds for her immediate firing. It is simply inexcusable that she was not present in the building each and every day last week, inspecting each room personally to identify such dangers and ensure that they were immediately remedied. Similarly, it is inexcusable if the School Board President did not accompany Dr. Schuster during these inspections of the building. From what we heard during the meeting, it does not appear that Board President Turek has set foot in HMS since the first pipe burst on January 4. He certainly did not state that he had. As Board President, his "boots should have been on the ground!" She pointed out that symptoms are being reported at a higher level than usual and identified that there are “medically fragile students” that are being affected who have "asthma, allergies, heart conditions, auto-immune conditions", and staff who also suffer from asthma, allergies and in one case a pregnancy. Teachers have consulted with their doctors and allergists and in the case of several teachers who are cancer survivors have been advised by their oncologists, who are very concerned, that they file for workmen’s compensation. Needless to say, when we heard this, as parents who have entrusted D181 to watch over and protect our children five days a week, we felt like we had just been kicked in the gut. We felt sick to our stomachs at the thought that we have been sending our children into a school that is not safe and in which teachers and students alike have been falling ill WITHOUT OUR KNOWLEDGE! Ms. Scott then presented the Board with the letter signed by HMS teachers and staff and asked the members to immediately come up with short and long term plans to address these long standing issues. Readers -- we will be posting a summary of Monday's board meeting later today. After listening to the meeting on Monday night, we were, to be frank, quite shell shocked by some of the disturbing information that we learned about the conditions at Hinsdale Middle School (which was disclosed not by Dr. Schuster, but by two brave teachers and a former School Board President and Hinsdale Trustee who made public comments), the truth about what is apparently behind the Learning for All Plan and the apparent need to now prop 4th grade students' math performance up by offering tutoring to them so they can keep up with the accelerated model that is being forced on them.We wanted to review the audiotape of the meeting before posting our reflections and will finish doing so later today. So stay tuned. In the meantime, several persons who attended the meeting have posted comments to our last post describing their reactions to what transpired at the meeting. Thanks to them for doing so, and we encourage everyone to read them. After reviewing the upcoming Board of Education Agenda for the January 13th Committee of the Whole Meeting to be held at Monroe School at 7pm, we were struck by the obvious simplicity of the meeting agenda. We are concerned; this meeting is important because of the Facilities Presentation and what it means for our district moving forward with issues like curriculum direction, technology, enrollment and space considerations, etc. Given the issues our district is facing, we are wondering why the following items did not appear on the agenda? Given the sweeping changes the Learning for All Plan has had on the district since fall 2012, where is the status report showing how the administration is monitoring differentiation and the effectiveness of instructional programs like Reading Fundamentals and Words Their Way? Dr. Moon’s return visit to observe suggested and administrative directed district changes is not mentioned. Why? When is she returning to follow up on her report? Dr. Schuster mentioned Dr. Moon would be returning at the end of January; why is there no mention of her and her role in presenting her findings to the board? How is the math curriculum progressing in the middle and elementary schools? Where is a comprehensive mid-year report showing how the changes to the math program are working? There are other issues to consider, of course, but we thought we would raise these for our readers at this time. As we have stated previously; we just don’t understand how BOE members can sit back and not push the administration for more detailed information. Why do they appear to be afraid to hold Schuster accountable? Now that everyone has had time to settle their children back into their school routines, this post will address the serious damage that occurred at Hinsdale Middle School as a result of the winter storm and the whitewashed "celebration" of this event that Dr. Schuster has painted in the midst of ongoing environmental concerns. We have reviewed the Board Docs information for Monday's meeting (click to open agenda for 1/13/14 meeting), as well as emails that Dr. Schuster sent to parents last week, news coverage and information that concerned district staff and community members have brought to our attention. We continue to address the serious HMS facility issues resulting from the extreme cold weather, including the water damage from roof leaks, two burst domestic cold water supply pipes servicing science lab stations in two rooms, and one burst sprinkler pipe located above the same rooms. Most importantly, we want to maintain a safe learning environment. We are concerned about negative health effects reported by staff and students. Additionally, there have some disruptions to the day as crews come into classrooms, and some students and staff have been displaced from their usual rooms. Additional maintenance support at HMS today and 24-hour maintenance staff coverage over the weekend to monitor the building. Dehumidifiers to remove moisture from the air and fans to dry wet areas. We anticipate much of the equipment currently in the building will be removed after this weekend. Air quality testing, with any recommendations for adjustments to be made presented within the next week. New bookshelves ordered for the MRC to replace those with water damage. This has been a challenging week for HMS and our Buildings and Grounds team. Again, maintaining a safe learning environment is our top priority, and we will continue to move forward in making decisions to support our students and staff. For those of you who were unaware, last Saturday a pipe burst at Hinsdale Middle School causing flood damage to 3 floors, causing the indefinite closure of one of the science classrooms. Early in the week parents were notified that cleanup was underway and that school would be ready to open on Wednesday along with the other buildings. (Lucky for the district that the Polar Vortex forced the closure of all the schools for two days allowing for cleanup to begin.) Wednesday morning, however, HMS opened and a second pipe burst, this time causing extensive damage to the two largest classrooms in the building where chorus and band are taught.